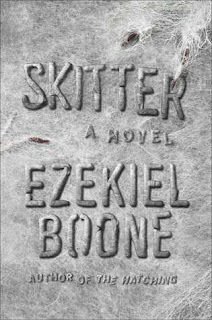 Skitter is the second book in The Hatching series by Ezekiel Boone. My experience with The Hatching series is sooo weird! I hate spiders, but I can't stop reading these books! I'm going to jump right in and say I enjoyed Skitter even more than The Hatching. Skitter upped the creep factor, but it's still very readable for those of us who do not enjoy the spiders. (Who does enjoy spiders? I'm not sure we can be friends.) I think the whole "black wave" of The Hatching and the size of the spiders really helps. Oddly enough, I appreciate a mass of spiders more than the singular creepy crawly. There are more to these spiders than we have previously known, though. I'm super freaked out about the next book. I'm sure I won't hesitate to read it, though. 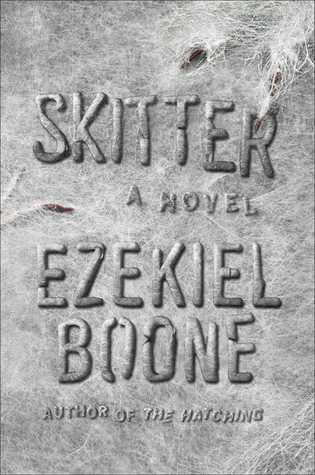 I really enjoyed the science in Skitter. I was reminded of Crichton a couple of times, and I would love to keep seeing more of that. If you enjoyed The Hatching, I'm sure you will enjoy Skitter, as well. It's a solid sequel that does a great job setting up the next book in the series. I'm hoping to read this next month. I remember reading The Hatching while on vacation over July 4th last year and am hoping to repeat with Skitter. I think this series is so much fun and it really doesn't bother me to read about spiders...now if it were snakes, that's another story. This really is the perfect series for July 4th vacation! Snakes I can handle. Spiders... NOPE. *shudders* I don't think I could read this series. I loath spiders. On the other hand, that might make these books even better...in a scary way. I can't believe I'm reading these! This series is getting really scary so it's quite possible he's building to something I can't handle. I know just what you mean. My phobia is spiders but I will every book out there with the nasty critters in them. LOL I enjoyed Skitters even more than The Hatching too. Creepy! I don't like spiders, but it doesn't bother me to read about them...as long as there are no up-close photos of them. :) These books sound like scary fun. Oh, gosh, no! NO PHOTOS. These books really are fun. I'm having a good time oddly enough. I still need to read this one. Cool that it reminded you of Crichton in some parts, that's pretty high praise! I hope you have a good time with it, too, when you get the chance to read it. This would freak me the crap out. LOL. Yeah... it definitely could! i also enjoyed this one more than the first - it had a strange sort of epic disaster movie feel.